Add this pig nose to any of our piggy costumes for a genuine swine snout look! The latex nose is a flesh color and is secured in place with elastic. 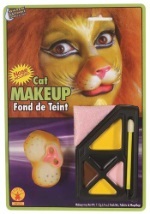 It has large slits for your nostrils and is the perfect touch to your animal costume! Match this pig nose with our Miss Piggy costume and join Kermie for a great muppet couples costume!